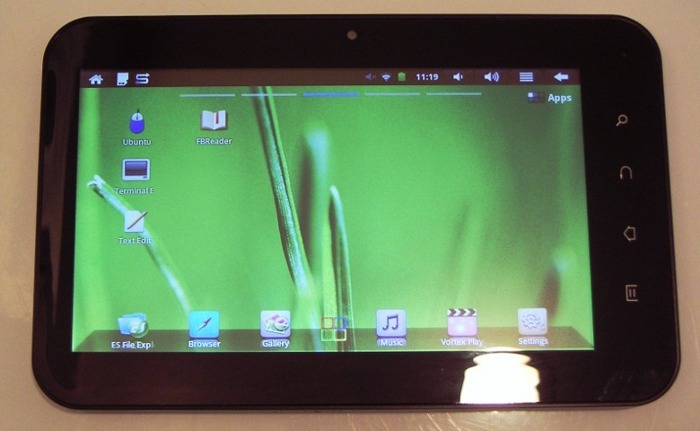 I recently bought an Android tablet, a Wopad V7+, (or possibly an exact clone of it, since I bought it at Deal Extreme, and it isn't labeled). It has a VC882 ARM Cortex A8 processor running at 1GHz, half a gig of ram, and a 4G internal TF flash card. I mostly wanted to use it as an e-book reader and for web browsing - it's much nicer to carry around even than a netbook. Looked at just as a reader, it was a lot cheaper than a Kindle or a Nook, but it also has two USB ports, an external TF card slot, and an HDMI output connector for video. All this, with five point capacitive touch screen, for $117 at Deal Extreme. On principle, I'm avoiding Google's Android Market, and the Amazon equivalent. The small print in the Google EULA allows Google to deactivate, without the device owner's knowledge or consent, any software downloaded from Android Market, and I imagine there are similar conditions with Amazon. It may well be true that this is intended to be used only for the good of mankind and all that, but just having to agree to something like that rubs me the wrong way. So the point is to find sources of open-source Android software elsewhere. Open-source provides some hedge against malware, because even though I'm not going to go through the source code, I know someone, somewhere, will. The first thing I turned up was F-droid, but it's also very useful to have a look on the various tablet forums, like Slatedroid and Androidtablets.net. So 420 mA for three hours is more like 1300 mAh, and my battery isn't doing as well as it should. If it was really 3000 mAh, I should be getting something close to five hours even with the wifi on. Android is based on Linux, and as with Linux, it is often useful to have root privileges for various tasks. This is not something that is automatically available in most Android devices. There is a process called rooting that reconfigures the system software to allow the user to operate as a super (priviliged) user. Various methods to do this work for various devices - here's what worked for this one. The tablet weighs 13 ounces, very convenient for carrying around. Sometimes I need a keyboard, though, as the soft/screen keyboard is useless for serious typing. 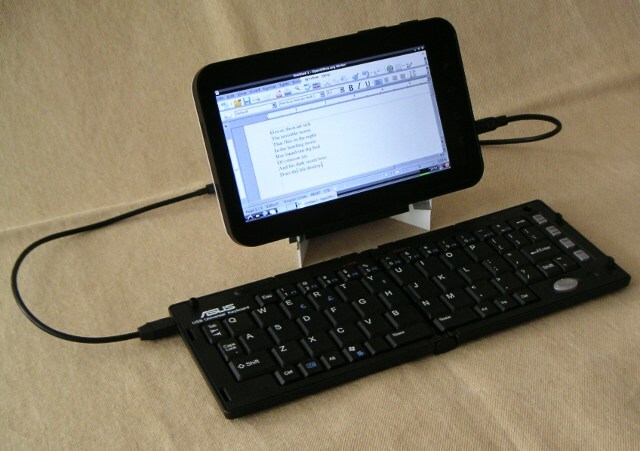 The combination of a tablet and a real keyboard is entirely practical for very portable word processing (especially with the tablet mounted on a lightweight stand behind the keyboard). I found a neat and sturdy folding USB keyboard from Targus that weights just eight ounces. It's no longer made, but it's still available on Ebay. I did, however, want to change some of the key-to-keycode mappings to make it more convenient and add a couple of missing keys. Here's what I did. My aim all along has been to have an inexpensive tablet running Linux. As there is a tool available - rootstock - to make a Ubuntu Linux image that will run on ARM processors, Linux can be made to run on this tablet. It's a little involved, both to install and to run, and you might think that the only reason to do this is to demonstrate that it can be done, but I have at least one practical application for this. There are no open-source word processors available for Android devices, and therefore nothing that will open .doc files. With Linux, I can use Open Office, both the word processor and the spreadsheet. The downside is that everything happens inside the Linux image on the flash card. So if you make a 4 G image and put it on an external flash card, with maybe ten or twenty percent of that reserved for Ubuntu itself, the remainder of the 4 G can be used for software and storage. But this all runs in a 'chroot jail' and there's no access, when running Linux, to any other areas of storage, so it becomes a little more difficult to move data around to where you can get at it. In fact, the only way to communicate with the running Linux operating system is via the network. Linux and a VNC server are started at the same time, and a VNC client (i.e. remote desktop viewer) running on the concurrently running Android side is used to talk to Linux. This means you have keyboard and mouse input and GUI output, but sound, for instance, isn't available. And the Linux end of things can't see the USB ports. All the same, this is useful and effective for word processing. From Android, the Linux image can be reached just by mounting it. That allows data (documents produced by the word processor, for instance) to be moved back and forth from Linux space to Android space, and thus to the outside world. Here's my step-by-step process for installing the Ubuntu Maverick version of Linux. Android logo reproduced from work created and shared by Google and used according to terms described in the Creative Commons 3.0 Attribution License.